Ancient and Medieval Siege Weapons recreates and analyzes the siege weapons of Ancient Egypt, Judea, Assuria, Persia, Greece, and Rome, as well as those of the Gauls and Teutons, the Byzantine Empire, the Muslim World, and Medieval Europe, all described with incredible detail and accompanied by illustrations and photographs. Konstantin Nossov offers new ways to envision various siege weapons based on the works of ancient and medieval authors, including Vitruvius, Vegetius, Apollodorus, Athenaeus, Heron, Biton, Philon, and many otherss. 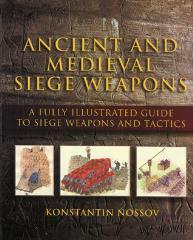 With chapters covering the history of siege warfare, siege weapons, different stratagems, and methods of attack and defense, readers will not only walk away with ideas of how to re-create siege weapons, they'll also take with them a better understanding of history from ancient times through the end of the fifteenth century AD.